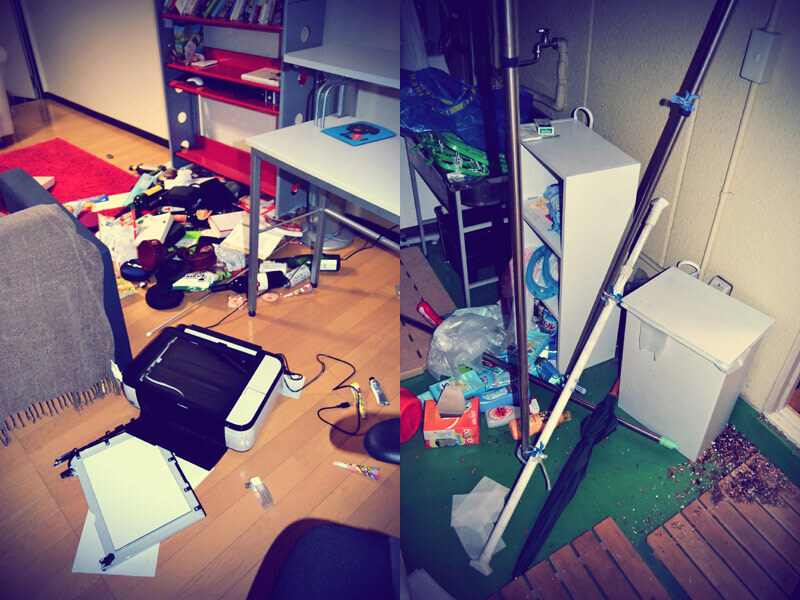 I already wrote a little bit about the earthquake yesterday, and I do not want to turn this into a news-blog, but here are two pictures showing parts of the apartment when I got home about 4 hours after the earthquake. For the most part the things are ok, apart from Broken Riedel champagne glasses, and well, the printer in the picture above was in pieces. Today has been strangely calm, I should keep on studying Japanese for my final tests next week, my school wrote that unless something severe happens, classes will be as usual from Monday. There are still aftershocks as I type this, and I have been feeling kind of seasick all day. Apparently there have been over 100 aftershocks and I can not tell if the house is shaking most of the time, or if it is just me who is dizzy. Apart from that they might take away the electricity for a while to save power, so that means no internet for a while. But I have food and water and everything I need, so I am sure things will be ok. I just want things to get back to normal, everything is very quiet and eerie right now. I can not believe all the damage I see on the TV, what Tokyo experienced was nothing compared to all of those poor people further up north. It is just unreal. Huff, er skrekkelig å høre om skjelvet! Håper alt går fint der nede, misunner ingen noe slikt.